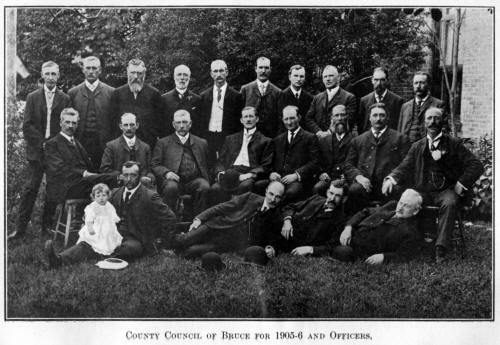 As the numbers became reduced of those who had entered the county of Bruce as its first settlers, a desire prevailed that, ere it was too late, an attempt be made to gather from their lips the story of the pioneer days; as this, with an accurate narrative of the early evolution of Bruce, must be obtained, if ever, before those who had been the active participants had passed away. In the preface to the Atlas of the County, published by H. Belden & Co., in 1880, is to be found the first effort made in this direction. This Atlas, however, was an expensive volume, and is in the possession of but few, and the historical sketch contained therein is but little known. 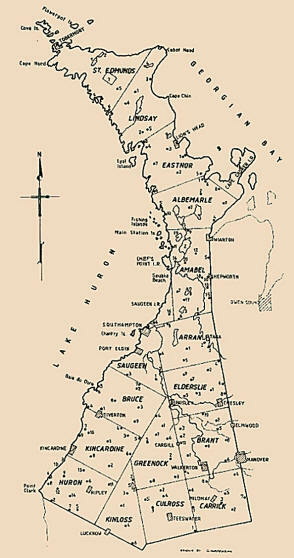 In 1896 the County Council offered a prize of $50 for the best paper on the history of the county. In response to this, two papers were submitted, one written by John McNabb, the other by the author of this volume. Both of these papers were considered to possess such merit that the Council offered to give to each of the writers the prize offered, provided that two additional chapters be written — one on the Schools of Bruce, and the other on the Militia and Volunteers of the County. These two chapters were supplied by the writer. After paying the promised reward, the County Council let matters rest, taking no steps to publish the manuscripts submitted. From the foregoing it may be seen that a knowledge of any historical facts relating to the county has been largely confined to the recollections of the oldest inhabitants, and to them only. The two historical sketches above referred to were prepared along different lines. Mr. McNabb wrote largely of the history of the several minor municipalities. The other sketch was a continuous historical narrative of the county as a whole. Perceiving that each form possessed merits the other had not, and thinking that a larger work combining these two forms would cover every historical feature necessary to be recorded, the writer suggested to Mr. McNabb a compilation of the two narratives. Nothing, however, was done to carry out the suggestion. After thinking it over for two or three years, the author resolved to start do novo and write a History of the County of Bruce along the line spoken of above. Putting both of the above papers aside, work in the way of gathering necessary material was commenced. It was not long before the author became aware that he had not commenced a day too soon. Death was very busy among the old pioneers, and in a short time he would have been too late. 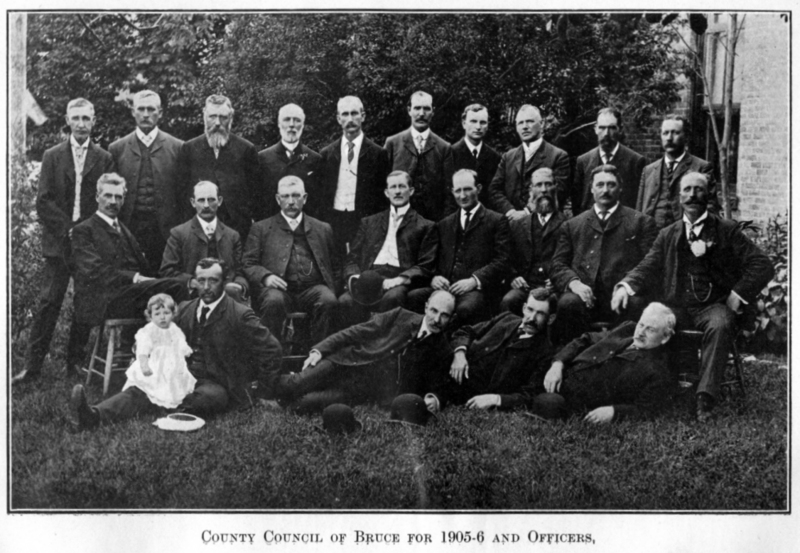 During the past eight years scores of old settlers have been personally interviewed; those who are no longer residents of the county have been corresponded with; the records of the county offices at Walkerton and Goderich have been searched, and also those of many of the minor municipalities. Various Government Departments at Ottawa and Toronto have, on application, supplied documents full of interesting historical facts. The libraries of Parliament have also furnished a quota of information. Piles of old newspapers have been closely scanned, and no stone has been left unturned to secure material for a full and accurate history of the county and of the minor municipalities therein. The first eleven chapters of this work refer to the county at large. Then follow twenty-seven chapters, each of which deals with a separate minor municipality. This method may have resulted in some repetition, but only where for the sake of the narrative it has been unavoidable, which, under the circumstances, the reader is asked to excuse. The author has met with the greatest kindness and willingness to oblige from every one from whom information has been sought. He desires to tender his most hearty thanks to all those who have so aided him. Especially would he mention the late Thomas Adair; W. R. Brown and Henry Smith, of the Crown Lands Department; W. S. Gould, County Clerk of Bruce; W. M. Dack, Registrar, and George A. McKay, Deputy Registrar of the County; the late Fred Lamorandiere, Indian interpreter, and the several county newspapers, from the columns of which many items have been culled. His thanks are also markedly due to James Warren, C.E., who generously permitted his large map of the county to be used for the purpose of obtaining the plates from which the sixteen maps of the townships contained herein are printed. The expense of publishing a volume such as this is greater than is generally imagined. 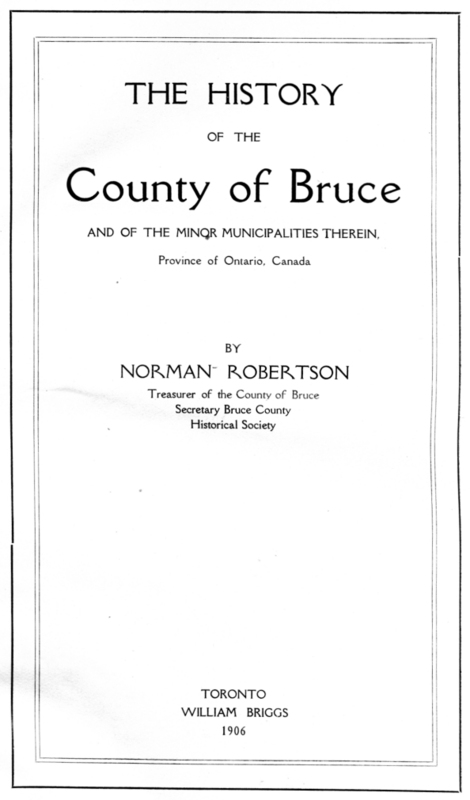 To help over this obstacle the County Council of Bruce, in a broad-minded, liberal spirit, granted one thousand dollars to the Bruce County Historical Society — under whose auspices this volume is issued — to assist in publishing it, on the understanding that the sum granted be refunded out of the first sales of the book. In connection with this grant a committee, consisting of A. W. Robb, William McDonald and W. J. Henry, was appointed by the County Council for consulting purposes. In writing this History the author has done so with a conscientious desire to avoid writing simply for effect. His effort has been to give a truthful historical narrative, lightened up with such local coloring as was available from the individual incidents and experiences of the pioneers. These personal experiences are fittingly narrated in a history of the county, for when the early settlers pass away there will be no one left to tell at first-hand the tales of the backwoods life of the pioneers of Bruce. While conscious of many defects in literary style, the author sends this volume forth with hopeful anticipation of a kindly reception from all those whose home is in, or whose home memories are associated with, the county of Bruce. A Novel of an Ontario Pioneer Family by Robert Laidlaw. 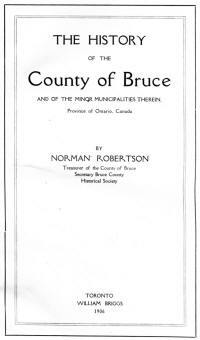 Where you can purchase a reprint of this book and others about Bruce County.